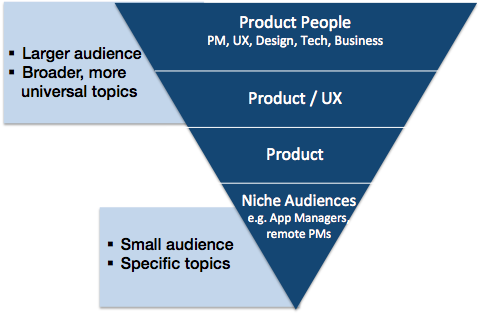 I’ve been writing about product management a little over a year now. Last week I was on stage talking about what I wished I knew before I got started. The audience was my company’s product community at our very first Xing Product Barcamp. I put together a summary of my talk below. 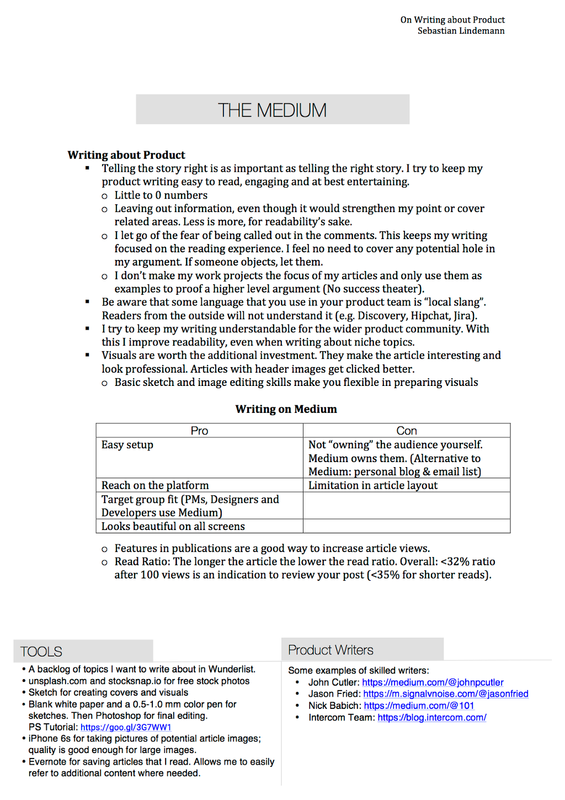 I share how I make writing work for me, what I learned from writing about product on Medium.com, and lastly why I believe writing is helping me become better at what I do. When I started writing in April 2016, I set myself the goal to publish a post every month. With every article I put out, I felt that I was improving my writing as well as my process around creating it. Today, I feel more comfortable writing articles. For my first posts I tried to write whenever and wherever I could. I squeezed sentences and paragraphs out of every spare minute I had. After some weeks, I had to accept that this was not working for me. I was coming up with words, but fell short of creating meaning. As a result, I now stick to a process that helps me improve my output. Before even writing connected paragraphs, I sketch out a skeleton article with a rough storyline. When the skeleton makes sense to me, I start to write with my door closed. I am borrowing this term from Stephen King’s On Writing — one of the best books on the craft. For my closed-door writing, I make sure to only start when I can have at least one distraction-free hour. I also stopped using my laptop and use a paper notebook instead for the first drafts. This allows me to work with my thoughts when they are fresh. Scratching words, adding them somewhere else, scribbling on the side — this is what pen and paper help me do and what I just cannot do on a keyboard. Only when I am happy with my article, I am opening my door again for the review. Having someone proof read what you put together surfaces the obvious flaws and typos that you have become blind to. Be aware though: While the review is the best thing that can happen to your article, it is also a disaster for every aspiring writer’s self esteem. 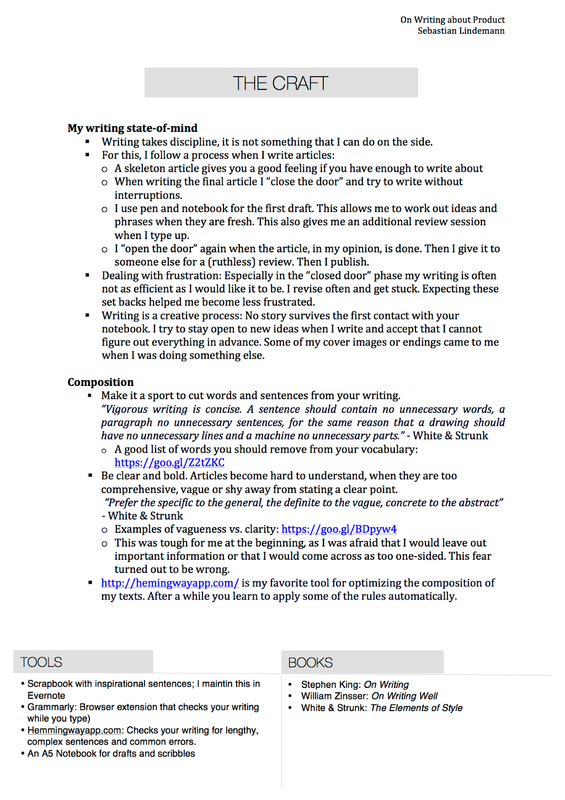 My process helps me work more efficiently and improves the quality of my writing. Yet, what most pleased me is accepting that even with a process in place, writing is above all creative territory. And on said territory there is no set way to the finish line. Especially with my product manager mindset, I was frustrated by this at the beginning. I was expecting to move forward whenever I was investing time. What happened was the opposite: I would decide to rearrange paragraphs for better readability, discover new angles after being almost done, think of a catchier introduction after revising it twice. Today, I stay open to new ideas and consider them vital stages on my way to a good article. Omit Needless Words: I make cutting words and paragraphs a sport. Even when a post is finished, I still force myself to find some words I can remove. My texts benefit from short, easy to read sentences and reduced clutter. Be specific, be bold: I want my writing to be to the point and specific. I put a focus on this as I saw the harmful effect the opposite had on my articles. The last time I had written longer texts was at university and this was still influencing my writing. I would trade understandability for fake eloquence. Sentences would read similar to this Strunk & White example: “a period of unfavorable weather set in”. A sentence more pretentious than informative. Today, I feel comfortable saying “it rained all day for a week” instead. Clarity trumps vagueness, even on a rainy day. The same goes for long sentences with endless sub clauses. They become difficult to read, so I break them into shorter sentences. I apply the same focus on clarity to the arguments that I make in my text, stating them as bold as possible to make sure I get my message across. Luckily, you do not need to check for these two composition rules all by yourself. There are tools that help you with it. 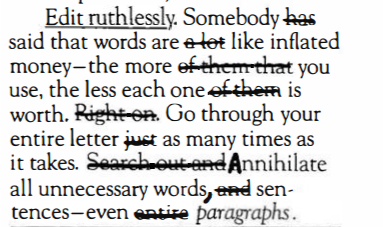 Hemmingway App highlights hard to understand text in your article with suggestions how to improve it. Grammarly checks your text for mistakes as you write and offers alternative suggestions. Next to my general learning on writing, I also gained experience around product related topics and publishing them on Medium. My topics come from what I am surrounded by at work. For my writing, I still need to give them a different spin, so that the stories do not read like a presentation at the office. For this, I need to become less product manager and more like John Oliver. In his late night show Last Week Tonight, the comedian is explaining complicated, sometimes even tedious, topics in brief 15 minute episodes. He does this in an easy to understand and entertaining way, managing to make the topics relevant to the audience. An ending that puts your piece to a grateful end. Too many facts: For readability’s sake, less is more. I consciously omit facts and information, even though they could further strengthen my point. For the reader to understand what I am saying, one supporting example is as good as five. And sometimes even that one example can be removed. The full picture: I let go of the fear of being called out for missing information and resist the urge to cover any potential hole in my argument. If people object in the comments, let them. Adding clarifying sentences, just to be on the safe side, makes the article long and complicated. Again, readability and simplicity trumps completeness for me here. 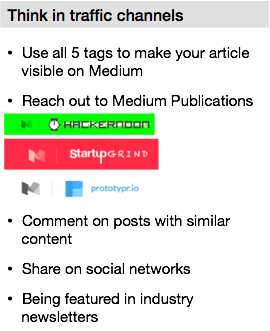 When you are writing about product, you are writing for a wide range of disciplines — Designers, Developers, Product Managers, Founders, and the list goes on. You might speak to one or many of those groups depending on your topic. I try to think about which groups I am addressing with my article before I start writing, and then shape and structure it accordingly. We are all part of the global product community, still I noticed that product organization’s tend to speak “local slang”. There are certain words (grooming vs. refinement vs. estimation) and tools (Slack vs. Hipchat vs. Skype) that readers from the outside will not understand, or at least won’t feel as familiar with as you. This breaks rapport with the audience and can be prevented by using more universal terms. To reach our product community in the first place, I have found Medium.com to be a good publishing vehicle. The platform gives your articles an audience even if you do not have many direct followers. What also made me chose Medium is the ease of publishing and the beautiful article layout. If I had needed to setup and manage my own blog, I probably wouldn’t have started in the first place. Thinking in traffic channels: Visitors come to your article from many different sources and it is good to make your post visible in many of them. Being featured in a publication is the most effective way to increase visibility on Medium itself. Publications aggregate content around specific topics from Medium writers and have a large follower base. While publications have to contact you through Medium to include your post, I stopped being shy about reaching out proactively — so far this worked out well for me. Cover Image: It is always worth the investment to prepare a cover image for your post. It draws attention to the post on Medium, but also when shared in social networks. Read Ratio: If less than 34% of your readers finish your article (Medium gives you this number), think about revising your article; especially the introduction. Headline Check: When you prepare your headline, ask yourself if you would click on it yourself. If you are unsure, it is worth a revision. When I started to write, my motivation was to be more visible in the product community. This changed, and I learned that writing does much more for me. Today, I am motivated by what writing helps me achieve personally. 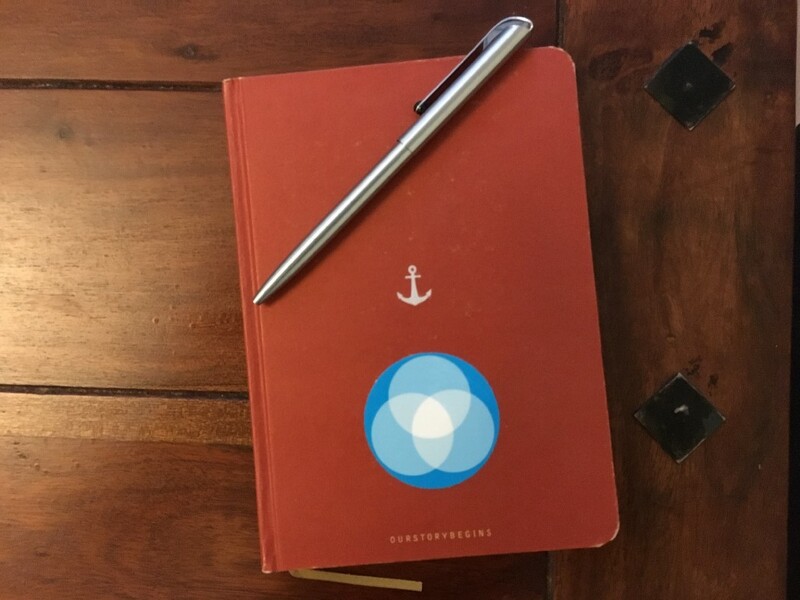 I write to reflect, learn and grow as a PM. Writing articles becomes much more rewarding with this mindset. Even though I am thinking about how to best reach an audience, my articles do not need to be a whooping success for me to be happy with them. Writing helps me to make sense of the thoughts in my head. Thinking about a topic is a great way to reflect and helped me understand and learn form my experiences. For instance, I wrote about the inconvenient truth that all the digital products we create will soon be gone after a product that I created got shut down. Also, you will learn a whole lot more about the topics you chose to write about. In one of my earlier post, I applied the psychology of Flow to product experiences and got the chance to learn a lot more about the concept. Further, publishing has become a way for me to make my work and efforts last. Even if the products I create are shut down and forgotten, I still have learned from it and it’s out there for everyone to see. In the last year I improved my knowledge around language and communication significantly. It comes with no surprise to me that Ken Norton, product management mastermind and partner at Google Ventures, recommends Stephen King’s On Writing to every product manager. We communicate a lot at work. Learning from the masters helps us be better at it. Over time, I also learned about image editing and design when I prepared graphics and header images for my posts. To be more flexible when it comes to creating visuals, I recently also picked up sketching. Learning about all these skills further motivates me to keep trying new things. After a year, I see the benefits from writing more clearly and they are a strong motivation for me to keep going. Also, these benefits are not exclusive to product managers. Writing gives everyone the opportunity to reflect, learn and grow professionally. And from my experience, you do not need to be a good writer to get started. A Medium account, some discipline, and a copy of On Writing will do. All I need to get started with a new article. Mind The Product sticker not required, but I’m sure it helps somehow. 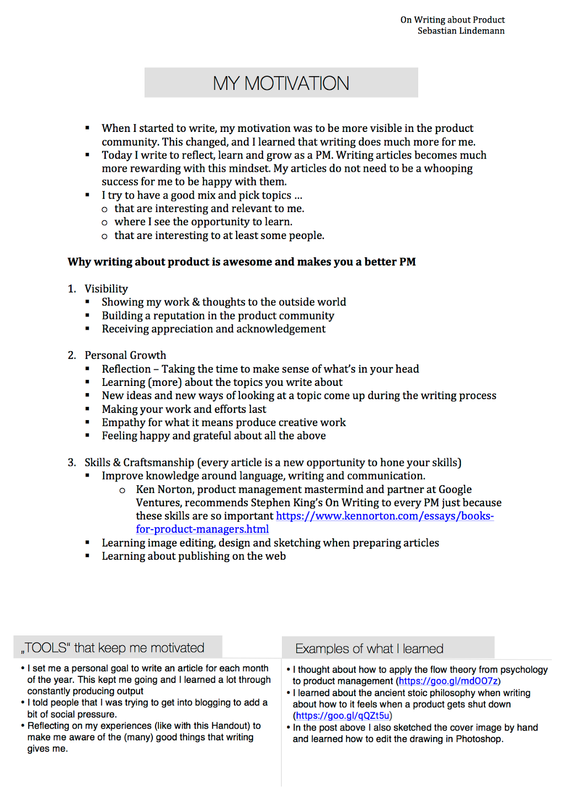 Some people reached out to me for more information on the tools I use and the books I have read; Below you can find the handout of my talk with more information on this plus some more insights into my process and motivation. On Writing about Product was originally published in ProductCoalition.com on Medium, where people are continuing the conversation by highlighting and responding to this story.